The hero says this line to the heroine when they’re at odds, yes, but it’s a romance. There’s a happy ending. Pain and suffering are worth it because the bad experiences lead to the ultimate prize for each character. They’re a kind of dues-paying. So the movie itself undercuts the hero’s assertion: life contains pain, yes, but it’s not identical with pain. In the end, love, friendship, and satisfaction trump suffering. But real life isn’t like that, is it? Sure, many people find happiness, but some get far more than their share of suffering. Some people — perhaps many people — spend their entire lives desperately needing something they’ll never get. Some people lose everything they love. Some people have experiences that destroy them. Maybe it’s too extreme to say “life is pain” for all of us, but it sure as heck is for some of us, and I bet many of us have dark moments when it feels that way. I’ve been involved peripherally in the world of writing for many years, now, and since I wrote my first book, I’ve gotten to know quite a few more authors. Thus, I can say with some confidence that people write for many reasons. Some feel they have a story inside them clawing to get out, and they find no peace until they write it down. Some write because they enjoy it, some because they appreciate the challenge. As for me, I write to make recompense for pain. When I open a book to read, I forget myself, forget my life, forget my problems (piddling as they are, compared to many people’s). Instead I focus on other people’s problems, other people’s pain, other people’s happiness. I may suffer with them, but at least it’s not my suffering. And when they feel joy, so do I. Some view read reading as a solitary activity. I disagree. I think reading is profoundly social, a turning away from a focus on the self, an engagement with the other. What does it matter that the others inside books aren’t real? They’re real to me, and in their variety, they show me far more worlds than I would ever see if I were restricted to my own day-to-day experiences, which are so limited by the particulars of my life. That’s reading: a turning away from inwardness that brings a respite from the trials of selfhood, however brief, and tutors us in empathy for people we might otherwise never consider. That’s why I read. And that’s why I write. Other authors have given me recompense many a time. Now I want to give recompense to others as best I can. 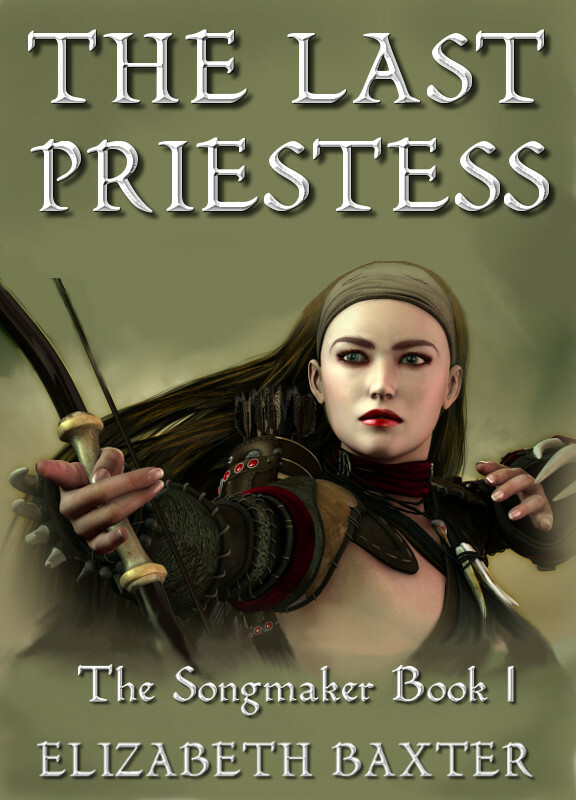 Today The Active Voice is celebrating the release of The Last Priestess, a fantasy novel by author Elizabeth Baxter. Beautiful cover, eh? There is a name that is uttered only in whispers. The Songmaker. A ruthless rebel mage, he is bringing civil war to the once-peaceful kingdom of Amaury, enveloping all in a tide of violence. For Maegwin, a tormented priestess, the path forward lies in forgiving her temple’s enemies—but she dreams only of revenge. For Rovann, a loyal mage haunted by his failures, salvation might be found in the unthinkable: defying the very king he swore to protect. If they are to succeed they must form an unlikely alliance. For someone must stand against the Songmaker. Someone must save Amaury from his dark designs. But first, they’ll have to learn to trust each other. And so a magical fantasy of darkness and redemption begins. Maegwin de Romily woke with a headache on the morning of her execution. As she roused from dark dreams she became aware of smells first: damp stone, the skitter of rats, the hushed voices of the other prisoners. Then finally, sight. Dawn sunlight fell through the barred window so brightly it brought tears to her eyes and made her head pound like a drum, beating out the rhythm of her heart. I’ve been a bookworm since I was five years old. The first book I ever read was about a boy going shopping with his mum. I picked it up from my brother’s bedroom floor and suddenly those strange shapes on the page made sense. I could read! Hallelujah! I was soon working my way steadily through the school library and it wasn’t long before I realised that stories about dragons, elves and great big talking lions were by far the most interesting. And that was it, my obsession with fantasy fiction was born. I wrote and published my first book when I was six. This was a rip-roaring adventure tale called “The Golden Pheasant,” about, well, a golden pheasant. I wrote out three copies on bits of paper pulled from my school books, bound them in covers made from old cereal boxes, and gave them out to my teachers. And that’s it. I was a writer! When I’m not writing I enjoy playing tennis (badly), playing the guitar (very badly) and watching cricket whenever I can. I’m also intent on cramming as much world travel as I can into one lifetime. Funny, but my list keeps getting longer. You can never see it all can you? You can connect with Elizabeth Baxter on her blog, her Amazon author page, Facebook, and Twitter. Can Love Bring Back The Natural Balance of Things? Protector (Anniversary of the Veil, Book One) is based on twin souls and the energy of love released when they find each other. The belief in twin souls, that is, a soul mate in the form of your one true love, existing somewhere in the world and pulling you towards them relentlessly and ceaselessly, is the underlying theme of Protector and the entire Anniversary of the Veil series. Only, in this world that I created the energy released when two twin souls find each other is used for purposes that are not altogether enjoyable for the pair. In the world of the Anniversary of the Veil series, Joinings of such strong love, and the energy they release, have been used to build bridges and tall buildings, stem the flow of rivers, even change the duration and force of seasons. One thousand years ago, energy from one such pair was used to separate the world in half by a barrier only a select few can cross. On one side of this barrier, or Veil as it is called, they have continued with the forced Joinings, while on the other side the practice was eradicated. This was achieved mainly through the means of keeping the people ignorant and under the complete control of the Priesthood. The priests rule the realm from the shadows. Among other things, they also decide who can marry whom, so as to prevent any natural Joinings of love from occurring. Protector takes place at a time when the fate of this barrier must be judged. The decision of whether the Veil should continue to stand, or if it is time to let the world be whole again, must now be made. Princess Issa is one of a pair, called to her other half, her twin soul. She is ignorant of her true purpose, steered to go along and find her love, not knowing that a Joining waits at the end of her journey. Unbeknown to her, she is loved from a distance by Protector Kae, a soldier assigned as her bodyguard and the one whose role, whose decision, could decide the fate of all. How long can a world where something as natural as the energy of love is twisted and used for artificial purposes exist? Will love prevail and restore the natural balance of things? What price must be paid? Answers to all these questions and more wait in Decision Maker, Book Two of the Anniversary of the Veil Series, which is already out. 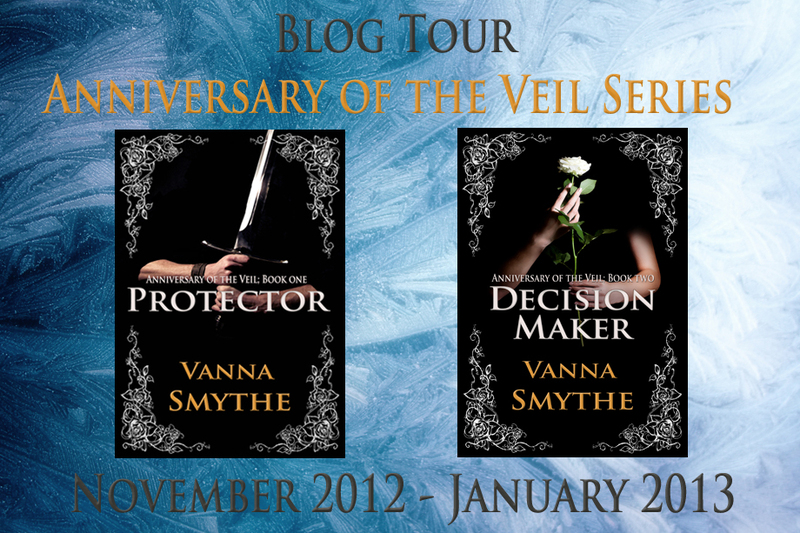 You can follow Vanna on Twitter or Facebook, and visit her website.